After more than two years in the making, Apple CEO Steve Jobs Tuesday announced the company’s intention to enter the mobile handset market, unveiling the new Apple iPhone. 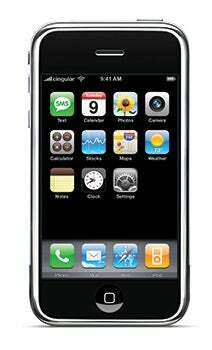 The iPhone brings together several features of the iPod, digital camera, smart phones and even portable computing to one device, with a widescreen display and an innovative input method. “Every once in a while a revolutionary product comes along that changes everything,” Jobs said. Featuring a new input technology called “Multi-Touch” the iPhone features only a single physical button, called “home.” You control the phone by sliding a finger across its touch-sensitive 3.5-inch display, which has a resolution of 320-by-480 pixels at 160 pixels-per-inch display. The 0.46-inch (11.6-millimeter) thick device weighs 4.8 ounces (135 grams) and sports a 2-megapixel camera, volume control, ring-silent switch, 3.5-millimeter headset/audio jack, SIM tray, “sleep-wake” switch, speaker, microphone, and a 30-pin iPod dock connector. The quad-band GSM (850MHz, 900MHz, 1800MHz, and 1900MHz) + EDGE phone also has 802.11b/g Wi-Fi and Bluetooth 2.0 capabilities. Jobs noted 3G capabilities will come in the future. Three smart sensors also help control the iPhone’s behavior. A proximity sensor shuts down the display and touchscreen when the phone is held to the ear. An ambient light sensor automatically adjusts screen brightness to save power. Meanwhile, an accelerometer lets the phone know whether to display in portrait or landscape mode. Despite the phone’s revolutionary features, Jobs claimed that the phone’s strongest feature was its redefinition of how calls are made. The iPhone’s photo management features are equally interesting. Its software enables users to use a “pinching” motion to zoom in and out of pictures, and to orient pictures in standard or landscape mode. When playing music, the iPhone can automatically adjust levels up or down as calls come in. Jobs said Apple plans to bring the iPhone to Europe in the fourth calendar quarter of 2007, and to Asia in 2008. Jobs also mentioned two accessories for the iPhone: stereo headphones with integrated microphone, and a Bluetooth headset that pairs automatically with the iPhone and goes to sleep to preserve battery life. Editor’s Note: This story was updated at 1:55 p.m. PT to include more information about the iPhone’s features, accessories, and availability. This story, "Apple unveils iPhone" was originally published by PCWorld.